Inewsource filed Public Records Act requests with the California Division of Safety of Dams and 19 dam-owning public agencies, such as water districts, requesting the latest inspection reports and emergency action plans, if one existed. The county’s oldest is Helix Water District’s Lake Cuyamaca dam, an earthen structure constructed in 1887. The inspections can turn up crucial early warning signs of problems that, if left unchecked, could lead to a dam’s failure. Mark Ogden, a project manager at the Association of State Dam Safety Officials, a national nonprofit organization, said that dam failures are a fairly regular occurrence. “I think it probably happens more frequently than most people think,” said Ogden, pointing to the failure of more than a dozen South Carolina dams during severe flooding last October. In most cases, state data suggest a dam failure around here wouldn’t be catastrophic. However, 20 San Diego County dams were considered high hazard in 2002, meaning failure would likely result in the loss of human life. They include the dams at Lake Hodges and the San Vicente Reservoir. SAN DIEGO, CA. — Sempra Energy-funded Center for Sustainable Energy’s (CSE) Equinox Project has released its 2016 San Diego Regional Quality of Life Dashboard, which assesses the top economic and environmental indicators to gauge the region’s progress toward sustainability. The dashboard is a nonpartisan report card that tracks and grades quality of life indicators in 15 categories from data supplied by 28 sources to evaluate livability in the region. This is the seventh edition of the dashboard since the report’s inception in 2009. Compared to last year, the seventh annual report shows four indicators that have improved significantly, including employment, entrepreneurship, renewable energy and water use, while two indicators showed regression, specifically landfill waste disposal and beach water quality. Among all 15 indicators, six are up, six are down and three remain neutral or report no new data: air quality, cross-border issues and climate change impacts. “The Quality of Life Dashboard provides the community with high-quality, transparent data useful for better understanding the intersection of business, government and the environment in the San Diego region,” said Mary McGroarty, vice-chair and board member for CSE. “The 2016 dashboard reveals a mixed bag of sustainability and economic trends for the San Diego region, but we’re hopeful policy actions to address climate change will help move the needle in the right direction for those indicators needing improvement,” McGroarty said. ESCONDIDO, CA. — Escondido Union School District has almost as many portable as permanent classrooms, 419 of the former to 489 of the latter in a district with 19,204 students. In fact, EUSD ranks second in all of San diego county for the percentage of portable classrooms in the district, about 45 percent. No other Inland North County district comes close. The figure ranks it as highest portable classroom share among districts with at least 5,000 students. EUSD exhibits a wide discrepancy in portable totals. Some EUSD school go well above the 50 percent threshold. Oak Hill Elementary, for example has 28 portable and 20 permanent classrooms, a 60 percent portable rate. Bernardo elementary has no portable and 32 permanent classrooms. 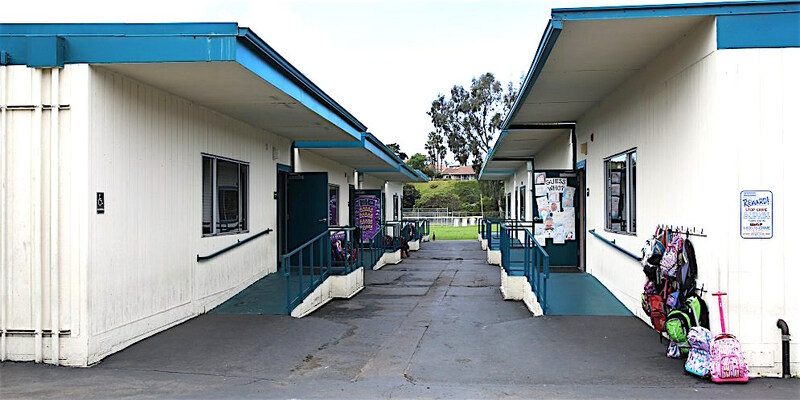 Escondido Union High School District has 23 portables and 294 permanent classrooms for 9,442 students a 7 percent rate, which was among the lowest shares for districts with an enrollment of 5,000 or more. Tiny San Pasqual Union Elementary School District has a 23 percent rate with 7 portable and 26 permanent classrooms. San Marcos Unified School District has 214 portable and 616 permanent classrooms for 20,452 students. Valley Center-Pauma Unifies School District has 46 portable and 164 permanent classrooms, a 23 percent rate, although district offices are housed in portables as well. For more, view this interactive online tool at http://inewsource.org/portables/#interactive. Sept, 18, 2015. San Marcos, CA. USA| Sprinter Station at California State University at San Marcos.|Photos by Jamie Scott Lytle.Copyright. SAN DIEGO, CA. — Voice of San Diego did a fact check on Escondido Mayor Sam Abed’s claims that SANDAG’s ballot measure allocates too much for public-transit projects in San Diego and not enough for highways in North County. 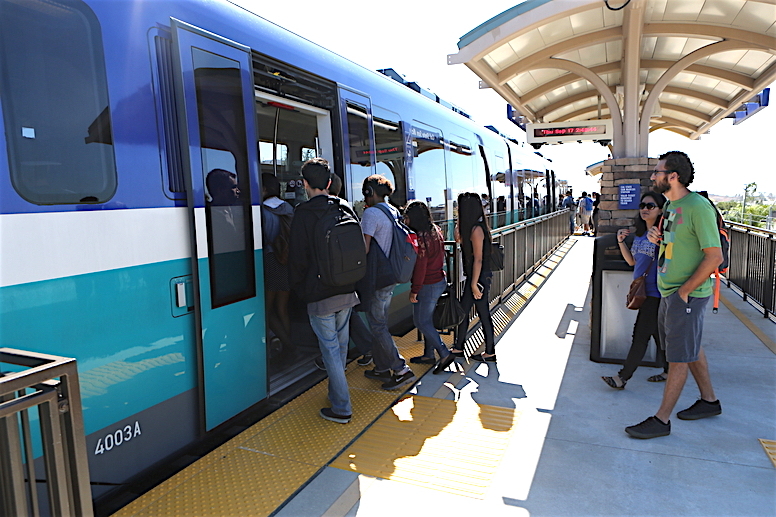 While it’s true that increased transit funding is more beneficial for dense San Diego than suburban Escondido, transit dollars are still useful for North County, Voice of San Diego found. The board for the San Diego Association of Governments – a regional planning agency of elected leaders from around the county – is asking voters in November if they want to increase sales taxes for a host of regional transportation, infrastructure and preservation projects. The plan has drawn opposition from all sides, including one dissident group of North County leaders who argue their part of the county won’t get a fair cut. This includes two North County mayors who battled to become the next county supervisor for the northern coastal district, Escondido Mayor Sam Abed and Encinitas Mayor Kristin Gaspar. It also includes County Supervisor Bill Horn and Poway Mayor Steve Vaus, who both voted against putting the measure on the ballot. SANDAG’s plan would increase sales taxes by a half-cent for transportation and infrastructure needs. The measure would raise $18.2 billion over the next 40 years. Abed was right about two things: The plan would spend roughly 42 percent on public transit and 14 percent on highways. It would also give 30 percent to individual cities for local infrastructure and spend 11 percent on open space preservation and 3 percent on biking and walking projects. Abed has been one of the plan’s most outspoken critics. His complaint often comes down to the amount of public-transit spending that will happen in the city of San Diego. Before voting against sending the measure to voters, he reiterated the point once more at the SANDAG meeting two weeks ago. In an interview this summer, Abed said he is concerned that shifting spending toward public transit in central and southern San Diego could leave North County highways in long-term trouble. SANDAG’s executive director, Gary Gallegos, said the agency doesn’t look at the county as four separate regions. He doesn’t think claims of geographic inequity hold. Primarily, that’s because people who live and pay taxes in North County often work elsewhere. They benefit from improvements in other parts of the county. Abed isn’t just right about the funding breakdown for transit and highways – he’s also right that since most transit projects aren’t in North County, it gets less funding by virtue of being highway-centric. But his fair share argument – and that of other opponents in North County – lacks important context, Voice of San Diego concluded. Be the first to comment on "Keeping up with the region, dam it"